Got a PS3, PSP or a Vita? Love Grand Theft Auto? Well this might interest you then. 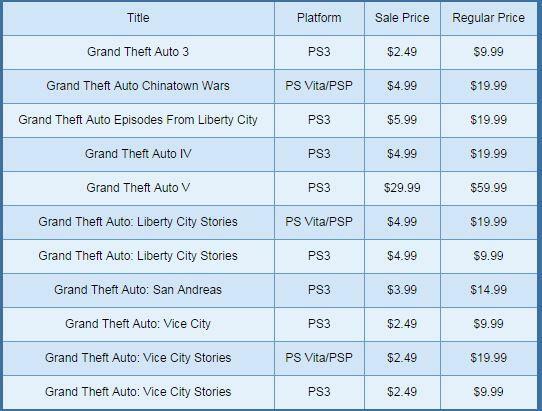 PSN is having a major sale on the Grand Theft Auto franchise and you can pick up all of the games from the franchise from GTA III all the way to GTA V. Even the semi forgotten GTA Vice City Stories, Liberty City Stories and Chinatown Wars are part of the sale. This isn't just a few bucks off either. Some of these games are marked down from $20 to only about $2-$5. I'm not sure when the sale will end but I assume it will only be a weekly deal so make sure to act fast. Below is a chart from the latest Playstation Store Update detailing all of the deals. Be sure to check that out along with all of the other sales going on right now.